Loved the entire experience in the beautiful apartment over the barn. Very easy to work with, very accomodating and responsive. Had a wonderful time, really enjoyed the property especially the view and the stairs down to the pier. Everyone I spoke with either on the phone or in person, were extremely friendly and helpful. Cedar Hill Cottage is a beautiful home. Very relaxing. Nestled up against wonderful trees in the back of the home, nice to look at when you wake up in the morning. Plenty of room for our family of 5. The staff was easy to work with and very friendly. They made us feel at home and supplied great information about where things were in Sequim. The Flying Pig was our landing pad. We were gone most of the day daytripping, but it was wonderful to come home to a beautiful place that our kids often referred to as "home." GREAT!!! Clean and comfortable house with a great view. All of your Team members were friendly and helpful-a pleasure to work with. The on-line rental process was very easy. There was excellent communication via phone and email before the rental and when we picked up the key, we got helpful info about Port Angeles. 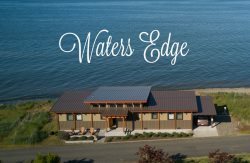 This home had everything we needed for a wonderful base for our family's forays into Olympic National Park- a well-equipped kitchen, a grill, multiple bedrooms and bathrooms, a washer and dryer and garage. The quiet location was beautiful with a view of the Strait-we enjoyed watching the big boats in the evening. There were birds to watch and the gardens were lovely.